No one likes having bugs around them, so imagine how your baby feels when they have a swarm of gnats around their mouth, ears, and eyes and they can’t really defend themselves. Your little one also doesn't experiences great discomfort when they become itchy after being bitten! So, you really need to protect your precious bundle of joy with the right bug spray. And while you may have heard bug spray should not be used on babies, that’s not totally true. There are many bug sprays on the market that are not only effective at chasing the buggies away, but are very safe to use. What's The Big Controversy Over Baby Bug Sprays? Bug spray definitely gets a bad rap, especially when it comes to using it on babies. I know I was personally scared to use any kind of spray on my baby because all of my friends warned me about how dangerous they can be. Something called DEET in particular (as well as picaridin and IR3535) is not safe to use on babies under two months of age according to the U.S. Centers for Disease Control. But, I know that insect repellents are very important because they protect your kiddo from tick and mosquito viruses (like Lyme disease and West Nile). So, as long as a bug spray doesn’t contain the ingredients listed above, you’re good to go when it comes to making sure your infant is safe (and please, be sure to double-check everything over with your pediatrician). Once your child is past the two month mark, per the CDC, you can use pretty much any kind of bug spray, though I always felt safer going the organic route. Before going out and buying a bug spray for your little one, there are a few important things to keep in mind. It's organic. As I mentioned before, if you just can’t wait until the two month mark passes, then you’ve got to go organic. There are lots of sprays on the market that are pretty darn effective with keeping the bugs away. It's long lasting. Look for a great spray that doesn’t need to be reapplied every hour, like my recommendations above. Its smell is tolerable. Who wants to have something sprayed on them that smells awful? Not me and certainly not your baby! Avoid spraying over open cuts, wounds, or irritated patches of skin-ouch! You will have one unhappy baby on your hands. Keep the spray out of reach of little hands! You should be the only sprayer. Only spray parts of skin that are exposed and keep away from your baby’s eyes, hands, and mouth! Follow directions as written on the product. If it tells you to spray it ever few hours, there is no need to continuously reapply it hourly. Wash your baby’s hands as soon as you come indoors—they may have come in contact with the spray and may spread it to other parts of their body. My favorite baby bug spray has got to be this one from California Baby (click here to check the price on Amazon), I just love it. What I love about the California Baby spray is that it's very safe and gentle for a baby’s skin. It's made solely from vegetable and plant based ingredients so you won’t find any chemicals and it’s totally non-irritating. It smells like a citronella candle and is DEET free. Be sure to apply it liberally since it is chemical free and follow directions on the bottle closely for reapplication purposes. 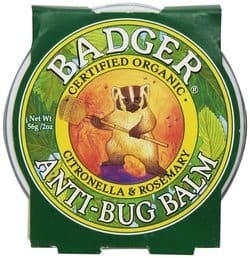 A slightly different approach to bug “spray”—but still super effective—is Badger’s Anti-Bug Balm (click here to check the price on Amazon), which is very safe for any member of your family to use. 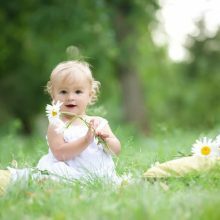 The company believes that the best way to protect your little ones from bugs, mosquitoes, and other pests is to go all-natural and organic. It contains zero DEET, petrolatum, or other chemicals that you’d usually find in a traditional bug spray. Plus, it actually smells great, it doesn’t weigh you down, and I have found that it really works. The balm is a combo of Organic Citronella, Cedar, and Lemongrass Essential oils that team up with Rosemary extract. It should be applied every 3-4 hours and is reasonably priced for approximately two ounces. A favorite among parents, AVON’s Bug Guard (click here to check the price on Amazon) is quite effective and best of all, smells really great!. It fights off mosquitoes, deer ticks, black flies, and even gnats while it protects the skin with its moisturizing qualities (thanks to aloe and Vitamin E). It’s non-greasy and you don’t even have to wash it off after you come in doors. In addition to being a bug repellent, it contains SPF 30 for additional sun protection and it’s waterproof if you want to wear it at the beach. You will not find any DEET, it’s PABA-free, and anyone in the family can use it! This particular unit comes in a 4-ounce container and is fairly priced. Another brand I am in love with, Babyganics also has an awesome insect spray for babies (click here to check the price on Amazon). It’s made with 100% natural essential oils like citronella, peppermint, rosemary, lemongrass, and geranium to keep away pests. It too is DEET free and does not contain the usual suspects (sulfates, phthalates, artificial fragrances or dyes). Since the spray is made from plant-based ingredients, it is gentle on a baby’s skin and is also light weight. This bottle contains two ounces and is priced about the same as the others. Now that you know all about baby bug spray, you can make a smart selection and begin protecting your little one from bugs, bites, and other harmful viruses!